Diario Judío México - South Africa and Vietnam don’t appear to have much in common, especially culturally. However, one of the nice aspects of living in California is that there are many immigrants from all over the world and they can intermingle and work together. Charles Koll Jewelers in Fashion Valley, founded by the late South African jeweler, Charles Koll, is a good example of disparate cultures coming together with positive results. 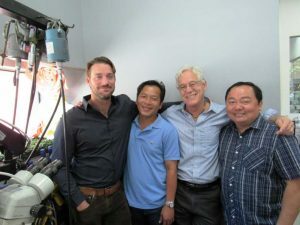 Charles and his son, Malcolm Koll, mentored a young Vietnamese immigrant, Khai Le, in 1993, and 20 years later, Le opened his own jewelry store, Khai’s Jewelers, in Rancho Peῇasquitos. Malcolm Koll was born in Pretoria, South Africa. In 1961, his family moved to Welkom, a gold mining town, where Charles had jewelry stores. In 1978, Malcolm had the opportunity to come to the United States and he met a woman who had a jewelry store in Seattle. She offered to sponsor his parents, so he could bring them over. Not happy living under Apartheid in South Africa, the Koll family decided to try their luck in America. In 1990, they moved to Orange County; then, in 1991, they came to San Diego when Charles Koll opened up his first jewelry store in UTC. With much hard work, the store became successful and Charles Koll made a name for himself in San Diego. In 2001, they opened a second store in Fashion Valley. They ran both stores until 2011 when the store in UTC closed. In 1993, a Vietnamese immigrant, Khai Le, and his family came to San Diego, sponsored by Catholic Charities. One of the agreements of being is sponsored is finding a job within six months. Khai’s sister went to apply for a job at a casting plant the Kolls had downtown. Khai went along to give her moral support. When they both met the manager, he didn’t hire the sister, but rather offered Khai, who had been a budding jeweler in VN, a job. His sister went on to study a career in school and Khai went on to work for the plant, casting wax models of jewelry, etc. He was stubborn and ambitious and although he sometimes butted heads with the manager and the Kolls themselves, Khai found a way to double the productivity at the plant. After that, he was transferred to the jewelry store where David Armstrong mentored him and showed him how to do everything. Armstrong was not only instrumental in helping Khai learn about the Jewelry business, he also took the time to teach him about American culture. Khai was still learning English and sometimes they communicated with pad and pen, but it was a successful mentorship. As Khai himself says, “The Kolls provided me with an environment where I could learn and grow.” Not only that, the Kolls encouraged Khai to spread his wings, and with their blessing, Khai opened up his own store twenty years after being hired. During the interview, one could see the respect and affection shared all around, including learning about each other’s culture. Khai still occasionally pops by the store to use tools there. His English has also improved tremendously and he is now fluent. In 2001, another Vietnamese immigrant, Loc Tran, came to San Diego sponsored by his wife’s family. He had been a jeweler in Vietnam and in 2002, under Khai’s mentorship, the Koll family hired him to work at their store where he continues to work today alongside another man from Vietnam and one from Mexico. The store is a good example of immigrants coming together to find a better life in America. Finally, Malcolm has also passed on the reins like his father did with him. His son Richard, who has his degree in finance, runs the everyday operations at the store. Malcolm, Richard, Khai and Loc also share a love of family. Each one is married with two children. Both Khai and Loc shared how grateful they were to the Kolls for hiring them and the Kolls in turn shared how much they respected their work ethic. Kolls Jewelers is known for their custom jewels and one of a kind jewelry pieces. They take their time working with each customer. They should also be known as a place that encourages diversity and for treating their long time employees like family. Miriam [Mimi] Pollack was born in Chicago, but moved to Mexico City when she was five years old. She lived and worked in Mexico for over 20 years. She currently resides in San Diego and worked as an ESL instructor at Grossmont College and San Diego Community College Continuing Education until June 2018. She writes for various local publications.